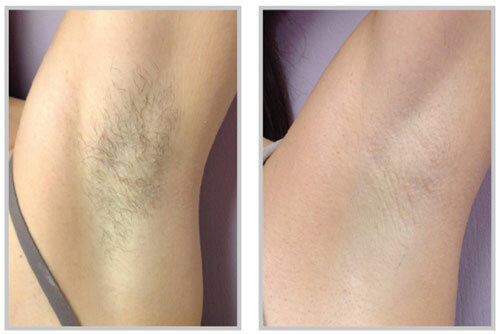 Altaire Clinic in Fargo, ND offers Forever Bare BBL™ as our preferred option for your laser hair removal treatment. This is the revolutionary new treatment that takes hair removal to the next level. Whether you’re looking for touchable confidence in the bedroom or picture-perfect confidence at the beach, Altaire will help you look and feel your best. Tired of shaving? Do you get annoying bumps after you shave? Laser hair removal is just what you are looking for. Kiss goodbye to the hassle and discomfort of shaving, painful waxing, and tweezing! Using gentle, yet effective BBL energy to heat hair follicles, the Forever Bare BBL treatment at Altaire results in hair removal that’s more comfortable, safer, and faster than other traditional treatments. With advanced technology, now you can be hair free! Laser hair removal is a quick, easy, and pain-free procedure. Hair follicles grow in cycles, so it typically takes 3-5 treatments, one month apart, to get your desired results. There may be some touch-up sessions, long-term, depending on how well you respond to treatments. Treat any area of the body with unwanted hair to reveal beautiful skin and dare to bare soft, silky, supple skin! Please keep in mind that each patient is unique and your results may vary. This is the revolutionary technology in laser hair removal. Traditionally, hair removal devices apply all of their energy to any given area all at once. By sending multiple lower fluence pulses at a high repetition rate, Forever Bare BBL provides a treatment that is safe, fast, efficacious, and comfortable. The motion BBL technology allows for extremely even heating of hair follicles and minimizes missed areas that occur with traditional hair removal devices. 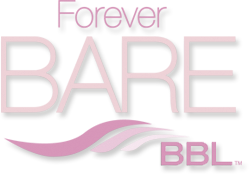 Forever Bare BBL quickly and comfortably removes body hair and keeps it from growing back without harming surrounding tissue. Forever Bare BBL can be used to reveal a smooth surface so your skin can look its best. Additional treatments include removing unwanted hair on sensitive areas such as lips, ears, nose, underarms and bikini line. No, this should be a painless procedure. Some people have areas of coarse, thick hair that may be uncomfortable but overall, very well tolerated. There is no downtime, you can return to normal activity immediately after the treatment. Will I Need to do Touch-Ups? Yes, there will probably be some need for touch ups in the future. Hormone changes is the most common reason for additional treatments in the future. This depends on the thickness and density of your hair. Most areas require 3-5 treatments applied at 4-6 week intervals to achieve optimal benefit. Long-term results depend on multiple factors such as hair thickness, the area treated and the hair’s growth cycle. You may require more treatments, but this will be discussed with your provider. Treatment time will vary depending upon the size of the area treated and your hair and skin type. Typically, a smaller area only takes a few minutes while a large area can take 15 minutes or longer. Forever Bare BBL is a comfortable treatment with virtually no downtime. In most cases, you can resume your normal daily activities immediately. days to a week after treatment you may experience what seems to be regrowth of hair. Most of these hairs are actually being shed as a result of your Forever Bare BBL treatment and are not growing back. Minimal aftercare is needed. Your provider will help you with more information on what to expect as well as give you an aftercare plan to follow that will involve avoiding direct sun exposure and using sunscreen.